Canadians have been confronted by this riddle since the first hunters appeared on the frozen northern tundra via the Bering land bridge. The Aboriginal peoples learned to survive by charting the land and sea with stories, songs, and stones. The Europeans who followed them employed modern tools to draw their own lines, using maps as agents of exploration and conquest. Even today we try and win ownership over nature from our foothold in outer space, using satellite images to photograph and chart the Earth’s surface. Where Is Here? 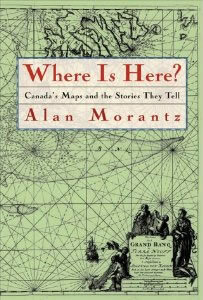 features an eclectic cast of characters: Inuit elders, hobos, a self-destructive Oblate missionary, gold-seeking seducers, a doctor turned mapmaker, a modern-day marketing guru, artists who turn maps inside out, orienteering athletes, a quirky road map collector, and a millionaire eccentric and Nazi sympathizer.